Itinerant movements (flights from one airport to another) increased 2.1% in September 2017 on a year-over-year basis to reach 367,221. During the same period, the level of local movements (flights that remain in the vicinity of the airport) fell 1.5% to 138,809. 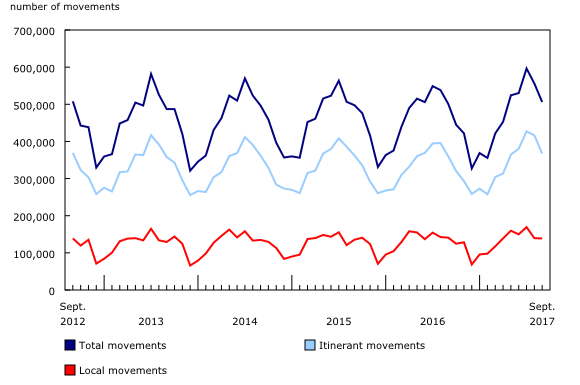 Domestic itinerant movements (within Canada) rose 2.2% from the same month in 2016 to 311,767 in September. The state of emergency in British Columbia first declared in early July remained in effect until September 15, the province's worst fire season on record. 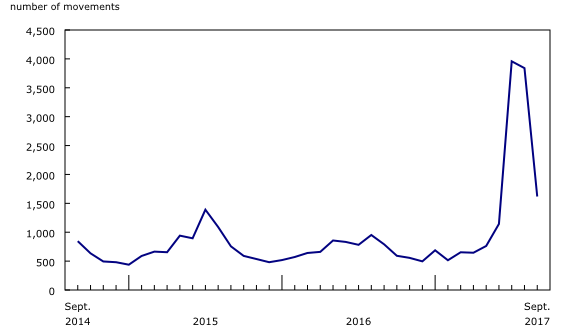 With a 105% increase in movements compared with September 2016, Williams Lake posted the largest year-over-year growth for the third consecutive month (+827 movements). As the home to the Cariboo Fire Centre's main office, the airport is one of the busiest wildfire response jurisdictions in British Columbia. Transborder movements (between Canada and the United States) decreased 0.7% to 41,492, while other international traffic increased 7.1% to 13,962 movements. In September, 10 airports accounted for 37.7% of total activity. 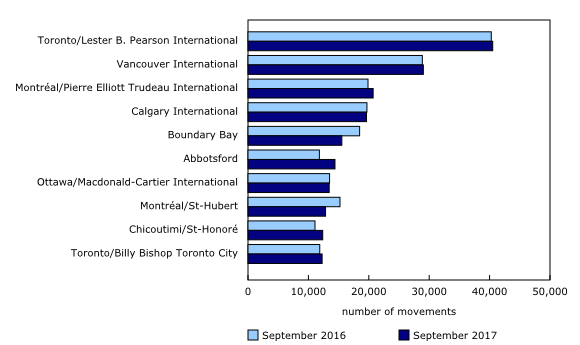 Toronto/Lester B. Pearson International, Ontario, the nation's busiest airport, reported 40,516 movements, up 0.6% compared with September 2016. This was followed by Vancouver International, British Columbia, which recorded 29,029 (+0.6%) movements, and Montréal/Pierre Elliot Trudeau, Quebec, with 20,714 (+4.3%) movements. An aircraft movement is defined as a take-off, a landing, or a simulated approach by an aircraft as defined by NAV CANADA. Additional analytical information is now available in "Monthly Aircraft Movements: Major airports – NAV CANADA Towers and Flight Service Stations, September 2017," as part of the service bulletin Aviation (Catalogue number51-004-X).